I would love to be able to tell a story of success and idolatry but that never happened in my formative years growing up and going to school in this town (Juneau). I can never say that any of my teachers connected with me on the level spoken of and encouraged in the Parker Palmer reading. Some of my teachers had a few of those traits, but it wasn’t consistently shared with everyone. I understand that in large classes, there are a lot of middle of the road students that seem to do well enough academically, that they do not “need” the attention that the best students need or the struggling students require. My saving grace was that I knew how to read and was able to decode instruction most of the time. Due to that, I was often invisible to the eyes of my educators. There were times during cultural events and history months that I may have gotten some extra attention, but that was not what I needed as a student. My favorite teacher experiences didn’t happen until many years later when I was in college and able to focus my field of study into an area that I liked and found personal meaning for. Dr. Jamal Martin, known to his students as Dr. J, is my favorite teacher. I can only imagine the level of success I may have encountered sooner in life if I had had a positive mentor like him while I was growing up. He was a professor in the Africana Studies program and even though he would be lecture heavy, the information that he would share would be necessary for our survival in the world. I can appreciate the value of knowledge and how it can be used to dismantle institutions that have historically held people’s hearts, minds, and bodies captive. He would give us projects that would force our research further and show us the importance of knowledge and the role that it has played in the survival of people worldwide. I appreciate him because my input and research was always valued and welcomed. He understood what it meant to be a single mother of color in the US trying to go to school and make a better life for herself and her child. He never judged me for taking the time that I might need to contemplate the information we may have researched or to complete a project. I plan to be a teacher much like Dr. J and to create a space where my students feel valued and that they know they are successful in. My students will not be invisible. 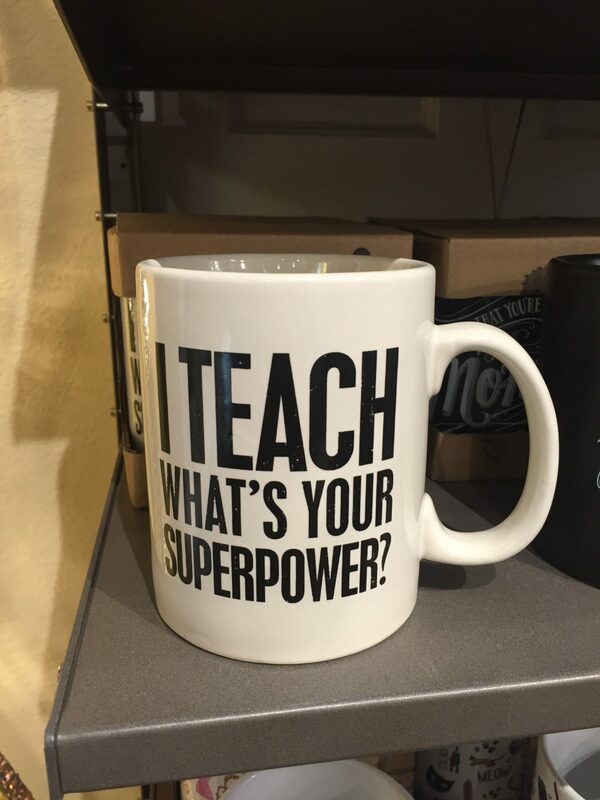 That will be my super power. As I am sitting here reflecting on these last 3 weeks of Alaska Studies, I am listening to James Brown and Maceo sing, “We gotta take it higher…” That is how I feel about education. With PBL I will be able to challenge my students to grow in ways that can be at their level of understanding because they will have the freedom to determine what is necessary for the project to be a success. I watched my cohorts challenge themselves that in some ways seemed unnecessary, but were necessary for their own personal standards of achievement. For myself, my challenge was not in doing the research or gathering the information, it was learning the technology of Ibooks Author and MyMaps so that it’s application in the future will not be so challenging. Using this method as a tool for us to see that there is so much more to learn about Alaska, was successful. We all got the opportunity to learn together at our own pace. Exploring the museum, books, archives, maps, and then in turn using that as a jumping off point for internet research was great. I consider cultural research to be my specialty, but more so using what I find to increase my understanding of social structures to be the value that I place upon doing the research in the first place. Avoiding top down education is valuable when we are seeking to empower our future leaders. I like that this method of inquiry allows students to select what is important for them to learn about while the teacher is able to ask questions to help them facilitate in their understanding of the topic. I really enjoyed how through this course we were able to explore resources, materials, technology, and group dynamics. The Ibooks were our way of showing our work. I still have yet to see everybody’s finished product, but I know that was not the point of the exercise. In the future, I plan to utilize a lot of these skills with my students because I feel that it will help them expand upon their skills of displaying knowledge that they may already have. Not being able to access technology in this day and age is a set back in growth and I really want to be able to help them access higher levels of achievement. Have books, televisions, and the internet replaced the role of the storyteller in this society? Before the days of the radio, tv, and written words, Storytellers were who we gathered around in the evening for entertainment, to learn morals, to learn the history of the community, and of the travels of visitors that may have been passing through. Stories can also be used to teach science, math, language, social studies, art, and survival. In our current society, there seems to be a simplifying of these stories to suit the english reading levels of small children, making these stories solely for youth and not for everyone. For me the subject of culturally relevant storybooks is a double edged sword. While I appreciate the art, I do not appreciate the simplification of the stories. While I agree that it is important to preserve the stories, I think they should be documented in a manner where they are intact. I read several story books in class that day and I did not find any satisfaction in any of them other then the story that was read to us. I found the books to be empty of reference to where the stories come from, with some lose reference through the art indicating their origins. As an educator I think I will have local Elders and Storytellers come in to share and to incorporate local knowledge into the lessons and to the school experience. Author Cecelia WestmanPosted on July 1, 2016 Categories LIT, Student posts4 Comments on Have books, televisions, and the internet replaced the role of the storyteller in this society? Creating our poster for this exercise was almost effortless. One we picked a letter theme, R, the rest just fell into place. 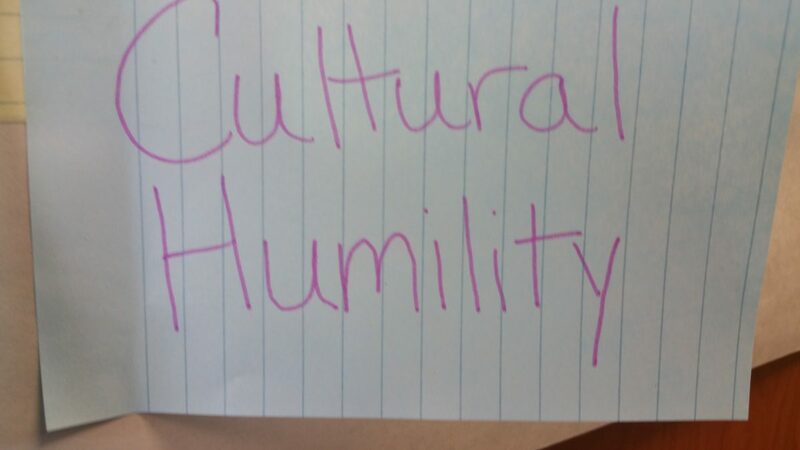 Constantly the theme of nourishment comes up when we discuss Culturally Relevant Education. This is because as educators, facilitating education doesn’t just mean feeding the mind, it means acceptance of individuals, meeting people as whole individuals where they are at, and creating a space of relevancy for their identities. 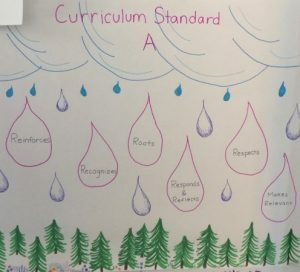 When we looked at cultural standard a, there are multiple strategies that came up that could support that standard as a value. It is important that we recognize that our students have roots and cultures that deserve respect. Having Ernestine Hayes read to us from her books was impactful. When I read her book years ago in New Mexico, I was floored by how much I could relate to her story, despite the generational age difference between us…the place was the same and so was the institution…the institution of racism, knowing your place, belonging, and being an outsider all at the same time. As a woman of color, a Kaagwaantaan, I grow in admiration of her every time she speaks because it is not just about her words, it is also about her delivery. Ernestine is magic. She has a way of stringing her words together in a seamless fashion that sings to you and draws you into her story so that you might catch a glimpse of what she is trying to show you. I appreciate her honesty and frank wit, especially when she is reminding people of where they are. She is unapologetic for the feelings of others when she speaks on her experiences in her life, what has happened here, and how violence will continue to be perpetuated as long as people stand by and do nothing. The title of her book, Blonde Indian speaks to the power of assimilation that reminds me of books like The Bluest Eye and Black Alice. We need more verbal illustrators, perhaps we can encourage the growth of a few through our educational strategies. I remember as a youngster learning about the absorbency of moss while on a hike with my aunt and my mom out at outer point. I remember squeezing the moss and attempting to wring it out-straight out of the muskeg and watching all of the muddy water running down my hands from the small amount of moss, Angie had handed me. Doing this activity increased my understanding of what muskeg was as well as how certain mosses would and could have been used in the past by the ancestors of this area. It was even more interesting exploring the topic in the class as an adult and having to be quiet about the answer. 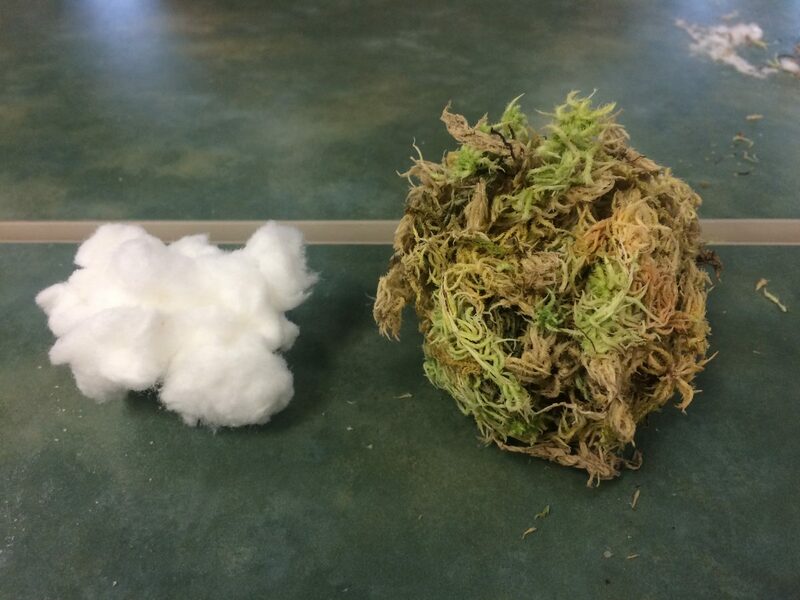 What was originally speculated on my part as youth was able to be confirmed through a fun hands on experiment showing that this moss could easily hold 10x it’s weight in water. Hands on lessons were always my favorite kinds of lessons because I am an exploratory learner. One thing that I always looked forward to in elementary school were our annual Sea Week explorations where we would head to various beaches around town to explore tide pools and find sea creatures. It was because of this that I appreciated the landed jelly fish study that was done by Paula Savikko. I also find it exciting that she used it as a source of activism for her students by empowering them to learn through their passion for the environment. That type of place based stewardship is important and it makes the lessons more meaningful. I also enjoyed the math walk. It gave us an opportunity to explore a place that we may not have been that familiar with, to practice skills that we may have not used in a long time, and to appreciate a sunny day while still being productive for class. Being someone that can not sit for very long in a classroom, I think it is going to be easy for me to incorporate active learning into my lessons and facilitations. All of these experiences were very worth while and I appreciate that we had the opportunity to participate in these exercises. I think that it has enriched and reinforced my approaches to learning.